A recently disbanded click fraud ring in China racked up $3 million worth of clicks in two weeks. $3 million that we're aware of. Just how detectable is this whole business of racking up fraudulent ad revenue clicks? 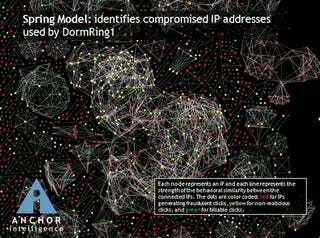 That intricate mess of lines above represents a portion of DormRing1, the click fraud bunch that was caught in China. The lines show the relationship of some of the IP addresses involved in the fraud and how they are connected to some fraudulent ad clicks. The whole network actually "involved 200,000 different IP addresses and racked up more than $3 million worth of fraudulent clicks across 2,000 advertisers in a two-week period." Impressive and scary at the same time. The trouble is that no one really knows how much ad revenue DormRing1 collected before they were caught. Click-fraud monitoring services such as Anchor Intelligence, the ones behind this catch, are evolving to keep up with the scale on which these rings are operating. It's still difficult to judge just how well they're doing as they're having to infiltrate forums and gain the trust of the perpetrators in a manner reminiscent of drug busts. But as the criminals are getting more elaborate, the investigations are too.